Columbia–Greene Community College (Co-Greene or C-GCC) is a community college located in Hudson, New York. Founded in 1966, C-GCC is one of 64 campuses governed by the State University of New York (SUNY) and is locally sponsored by two rural counties, Columbia and Greene, which have a combined population of about 112,000. 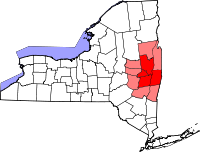 The College was originally located in Athens, New York until its permanent relocation to the City of Hudson in 1974. The College currently offers 32 associate degree programs and five undergraduate certificate programs. C-GCC is accredited by the Middle States Commission on Higher Education and enrolls approximately 1,578 students as of Fall 2018. In early 1966, the Columbia County Board of Supervisors together with the Greene County Legislature established a steering committee to determine the feasibility of jointly sponsoring a community college. By the end of the year, the SUNY Board of Trustees and the New York State Board of Regents granted initial funding and a charter to support the establishment of the College. Columbia–Greene Community College officially opened its doors in September 1969 to a class of 350 full-time and part-time students under the leadership of the College's first president, Edward J. Owen. Two years later, C-GCC awarded 35 associate degrees to its first graduating class during a small ceremony at Catskill High School. For its first five years, the College operated out of an old schoolhouse in Athens, New York. The College received full accreditation status by the Middle States Commission on Higher Education in 1975. In 1974, the Columbia-Greene campus was permanently relocated to a 130,000 sq. ft. building, now referred to as the Main Building, in the Town of Greenport just outside the City of Hudson. In addition to expanded instructional spaces and administrative offices, the Main Building also included a two-story library, a gymnasium, fitness center, and a cafeteria. In the spring of 1982, former President of the United States Gerald Ford was invited to the campus as the keynote speaker for a fundraising dinner hosted by the Columbia-Greene Community Foundation. Columbia-Greene underwent its first expansion in June 1989 by adding three new buildings, including a new Technology Center which would house the expanding automotive technology program, an Arts Center which would contain the College's first performing arts theatre, as well as a Day Care Center which would provide child care support for attending students. The College offers 38 academic degree and certificate programs under the Divisions of Arts & Humanities, Behavioral and Social Sciences, Math and Science, Nursing, and Technology. The Division of Arts & Humanities includes programs in Fine Arts, Humanities, and Computer Graphics and Design. The Division of Behavioral and Social Sciences includes programs in Criminal Justice, Education, Human Services, Physical Education/Fitness Studies, and Social Science. The Division of Math and Science includes programs in Environmental Studies, Math/Science, and Medical Assisting. The Division of Nursing includes the Nursing A.S. program which prepares students for careers as registered nurses. The Division of Technology includes programs in Automotive Technology, Accounting, Business Administration, Computer Science, Computer Security and Forensics, and Information Technology. The College offers Intercollegiate and Intramural Sports programs. Intercollegiate Athletics: CGCC is a member of the National Junior College Athletic Association (NJCAA) Region III, and the Mountain Valley Conference where CGCC competes at the Division III level. Intramural Sports: CGCC encourages participation in intramural athletics. Co-ed teams have been formed in volleyball and basketball. Everyone on campus is eligible to participate in intramurals (except varsity athletes in season). Varsity players, however, are invited to act as officials. ^ a b "IPEDS Data Center". nces.ed.gov. Retrieved 2015-10-20. ^ "Columbia-Greene Community College Fall 2014 Student Profile" (PDF). Student Profiles. Hudson, New York: Columbia-Greene Community College. 2014. Retrieved 2015-10-20. ^ "Columbia County QuickFacts from the US Census Bureau". quickfacts.census.gov. Retrieved 2015-10-20. ^ "Greene County QuickFacts from the US Census Bureau". quickfacts.census.gov. Retrieved 2015-10-20. ^ "Middle States Commission on Higher Education". www.msche.org. Retrieved 2015-10-20. ^ "Athletics". Columbia–Greene Community College Athletics. Hudson, New York: State University of New York. Retrieved August 16, 2018. This page was last edited on 24 March 2019, at 21:27 (UTC).